Try some morning espresso in a cookie instead of in a cup. It worked for me this morning when I had caffeine on my mind after scanning some lovely espresso foam art on Pinterest. 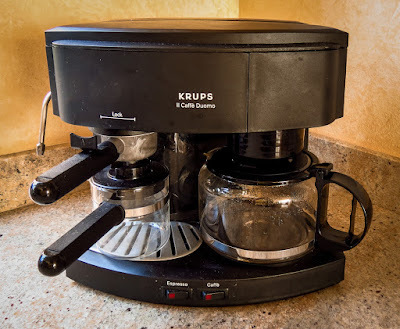 It has been a long time between home-brewed espressos. RL uses the drip coffee side daily, but the machine's espresso function hasn't see much action lately. My mornings now typically begin with a cup of flavored green tea, Moroccan Mint or Jasmine topping the list of current favorites. Whatever happened to those espresso cravings of the past? 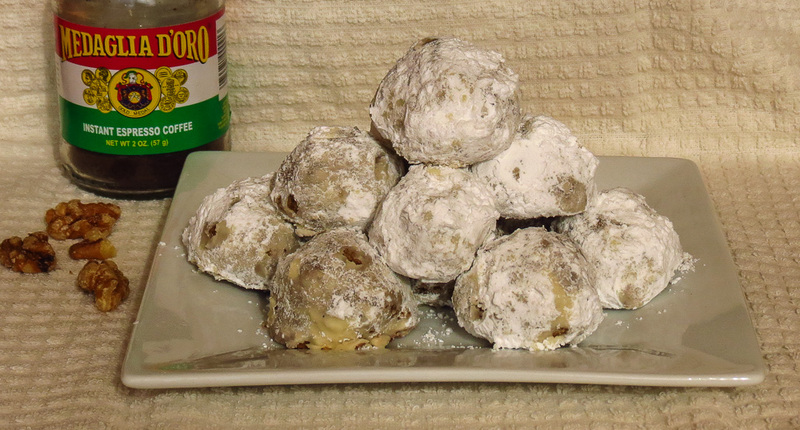 Don't know, don't care, for now I'll just nibble on some nutty, buttery, espresso-flavored snowballs. The cookies aren't fussy, but it is important to bake until the bottoms begin to brown, the cookies appear dry on the outside and they feel fairly firm to the touch. Let them cool a bit before moving to a baking rack, otherwise they will crumble. 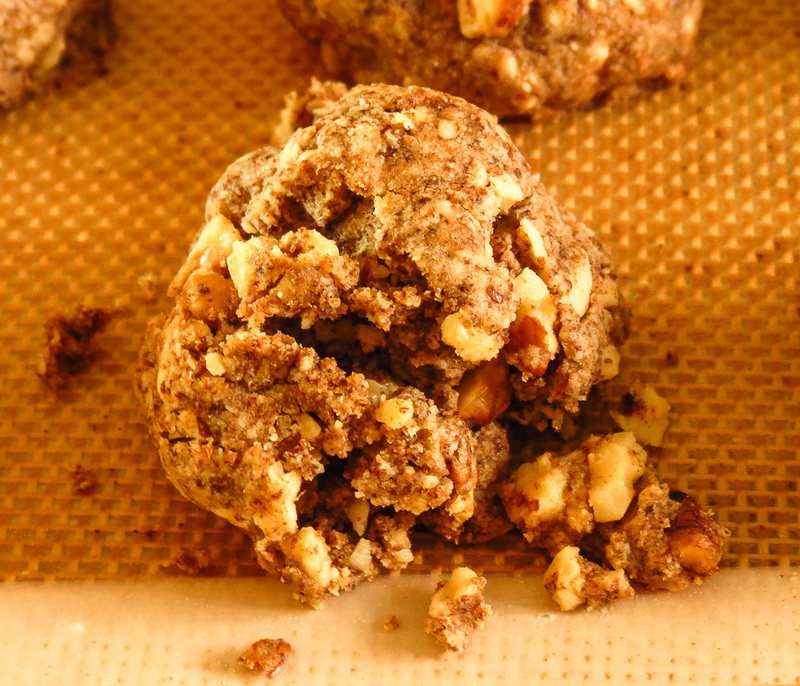 Maybe that is a bit fussy, but these expresso walnut bites are worth a little extra care. 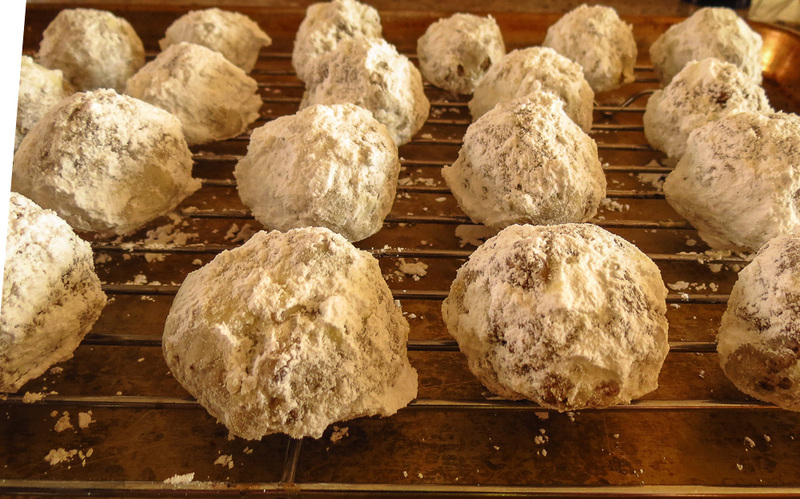 The cookie interior is a bit light on sugar, but a powdered sugar coating makes up for that, adding an airy sweetness to each bite. Indeed, so airy that you may find yourself wearing a fine dusting of white after you nibble on a few cookies. Warm cookies will absorb some of the first coating of powdered sugar as they cool. Give them a second roll in powdered sugar to assure a snowball effect; there is no such thing as too much powdered sugar, right? 1. Move an oven rack to the upper middle and preheat the oven to 325 degrees F. Line a baking sheet with a silicone mat or parchment paper and set aside. Prepare a flat bowl of powdered sugar. 2. Sift the dry ingredients together into a medium bowl: flour, cornstarch, salt, baking powder and instant espresso powder. Add the finely chopped walnuts and mix to combine. 3. In a second bowl use a mixer to cream together the butter and brown sugar. Stir in the vanilla and almond extract. 4. Add the dry ingredient mixture and use a large wooden spoon to work it into the creamed sugar and butter. Mix the dough until it is a fairly loose, coarse, crumbly meal. 5. 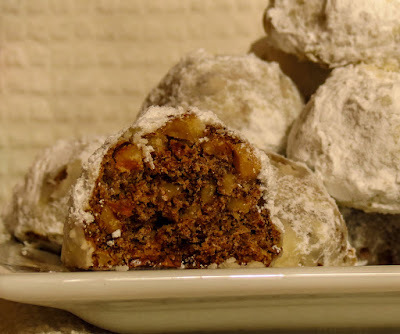 Roll heaping tablespoons of dough between the palms of your hands to form walnut-sized balls. Place an inch or so apart on the prepared baking sheet, the cookies will only spread a little. 6. Bake for 25-30 minutes, turning the baking sheet front to back halfway through the baking time. Bake until the bottoms barely begin to brown, appear dry on the outside and feel fairly firm to the touch. 8. Store in an airtight container at room temperature for up to five days. Freeze for longer storage. This loaf was planned to accompany a pot of French onion soup for a Bread and Soup comfort food kind of meal, note the emphasis on the past tense. But the fresh sourdough boule, so warm and fragrant pulled straight from the oven, was totally irresistible. One little end slice cut off for a quick taste test turned into a series of "just one more bite" nibbles, and you can guess where that led. Oh yes, the intended bread and soup lunch turned into bread-with-butter snacks, then bread snacks with a dipping sauce of olive oil and balsamic vinegar, and then RL tried a few bread slices with jam... and so it went, one slice after another. Forget the soup, we were full. No regrets; it was so delicious and onion soup will always taste better on the second day. I had intended to follow the basic recipe for Sourdough No Knead Bread, until I found one lonely can of Coconut Porter hanging out in the back of the refrigerator. How long had it been there? Quick flashback to a can of Pumpkin Porter and and the 2014 pita bread recipe. "Hmmmm" I thought, "what would the Beeroness do with Coconut Porter?" Right, she would sip it and/or cook with it, with great enthusiasm. So I did both. It turns out that I appreciated Maui Brewing Company's can artwork more than I relished the taste of their beer. Coconut? what coconut? Coconut was a total stealth note, so well-hidden that I couldn't discern any coconut flavor at all, not even a hint. That's not a bad thing in a glass of beer, in my opinion, but I had hoped for something faintly tropical. 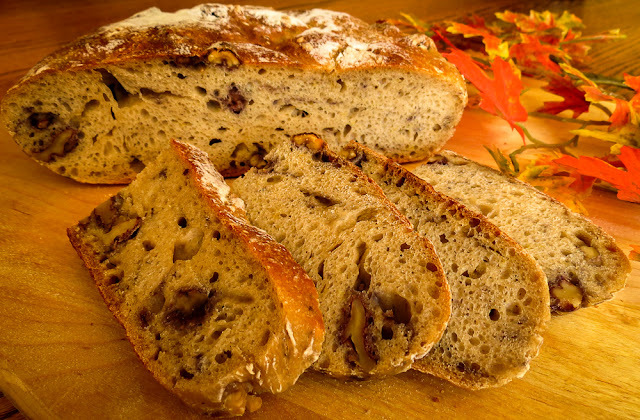 Coconut flavor was also absent in the bread, but this sourdough walnut loaf was damned tasty comfort food without it. And that's a good thing! Whisk flour and salt in large non-reactive bowl. Add the starter, water and beer. 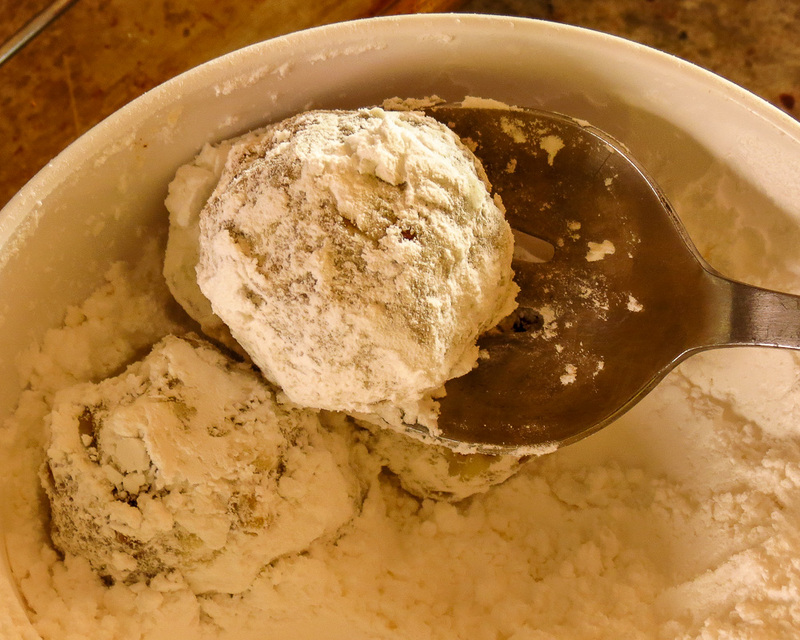 Use a rubber spatula or dough scraper to fold the mixture, scraping up dry flour from bottom of bowl until shaggy ball forms. Cover the bowl with plastic wrap and let sit at room temperature overnight, or for 12 to 18 hours. Place a 12- to 18-inch sheet of parchment paper inside a 10-inch skillet and spray with cooking spray (PAM, etc.). Set aside. 30 minutes before baking, adjust oven rack to the next-to-the-lowest position, place 4 to 6-quart heavy-bottomed Dutch oven with its lid on the rack, and preheat the oven to 425 degrees F.
Lightly flour top of dough; use a sharp knife to make one or two 6-inch long, 1/2-inch deep slits along the top of dough. Carefully remove the heated pot and lid from oven. Pick up the dough by lifting the parchment paper overhang and place it into the pot (let any excess parchment hang outside the pot over edge). Cover the pot and place in the oven. Bake covered for 30 minutes. Remove the lid and continue to bake until the loaf is deep brown in color and an instant-read thermometer inserted into the center registers 210 degrees F, about 20 to 30 minutes longer. Carefully remove the loaf from pot; transfer to a wire baking rack, remove the parchment and cool to room temperature before slicing. 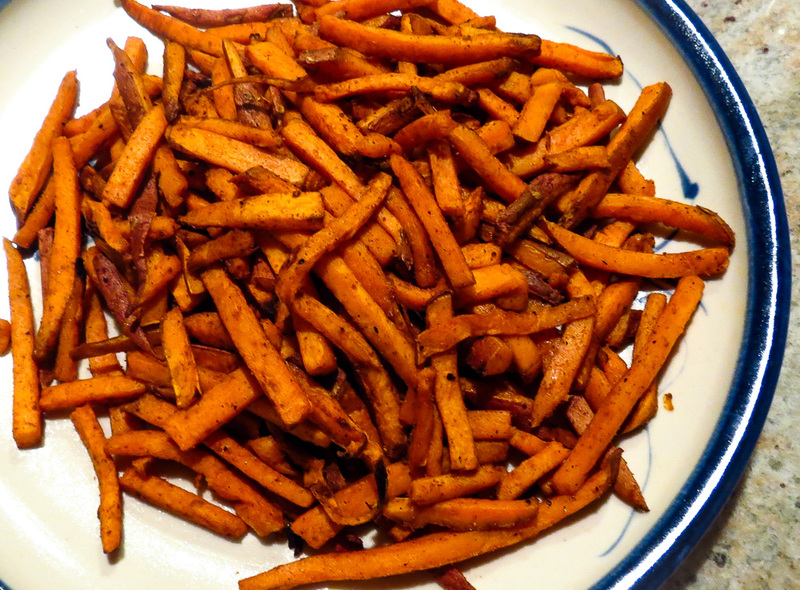 Sweet potato fries are a recent addition to my favorite food list. 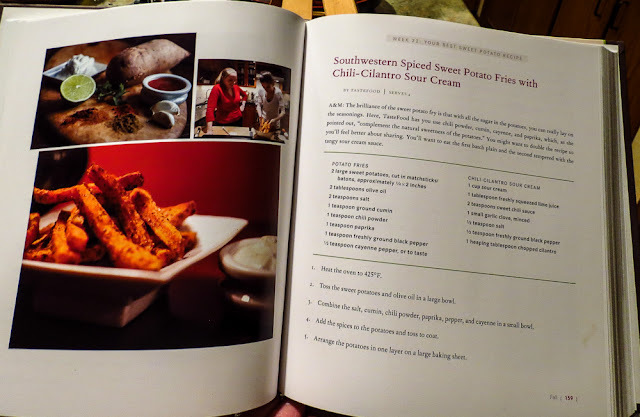 Not too many years ago you wouldn't find sweet potato anything as my favorite, no way! Just mention sweet potatoes and my taste buds would recoil at the thought of another cloyingly sweet Thanksgiving casserole topped with brown sugar and mini marshmallows... but that's history. 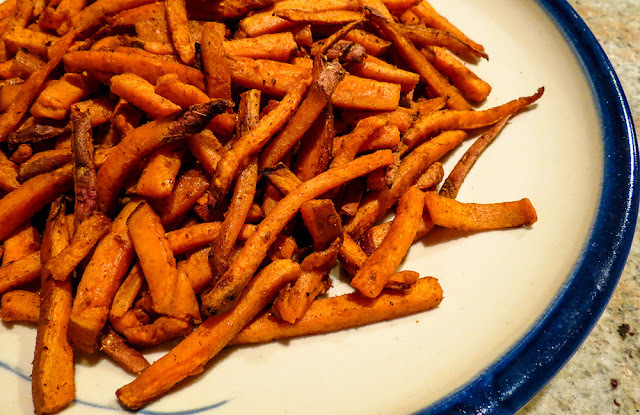 I have since learned to enjoy baked Hasselback sweet potatoes, nuked sweet potatoes mashed with a bit of butter, sweet potato wedges roasted with a hint of honey and cinnamon, and of course the ubiquitous restaurant-prepared sweet potato french fries. Sigh. if only I could replicate those crisp-on-the-outside fluffy-in-the-middle sweet potato batons, but baked in the oven and not deep fried. Baked seems so much healthier than fried, but the secret to a crisp exterior remains elusive. A Food52 recipe offered a promising start with a recipe that won Community Pick status. A spicy Southwest seasoning mix hit all of the right flavor notes, but the fries refused to crisp up enough to suit us me. We cheerfully ate almost the entire batch anyway. A remaining handful of baked fries were a tasty addition to the next morning's breakfast hash. Hilary's new spiralizer was no match for two largish, unpeeled sweet potatoes so she cut most of the sticks by hand. 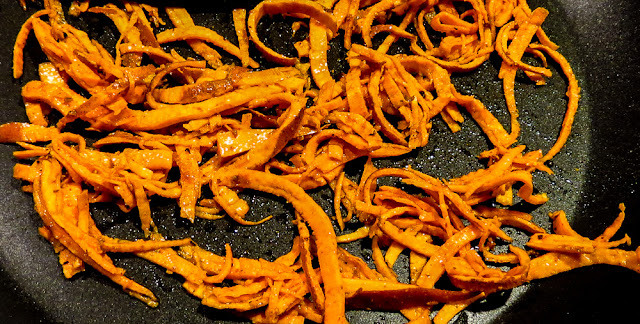 The few shreds that came off the spiralizer hit a hot, lightly oiled skillet and proceeded to wilt more than crisp and taste too strongly of peel rather than tater. Forget the pan-fried approach for skinny shreds! The hand-cut, oven-baked method produced such tasty fries that we voted to give it another kitchen test... soon. Perhaps more time in the oven will do the trick; we'll be more patient in the future. I just can't get enough of those spicy sweet potato fries. Use your hands and toss the sweet potato sticks and olive oil in a large bowl. Add the salt, cumin, chile powder, paprika, pepper and cayenne to a small bowl and stir to mix. Add the spices to the potatoes and toss to coat thoroughly. Arrange the potatoes in one layer on a baking sheet. Bake in preheated oven on the lowest rack until the undersides are browned, about 15 minutes. Flip potatoes with a large spatula and bake an additional 10 minutes. Remove from the oven and serve on a warmed platter. Offer Chili-Cilantro Sour Cream as an optional topping. 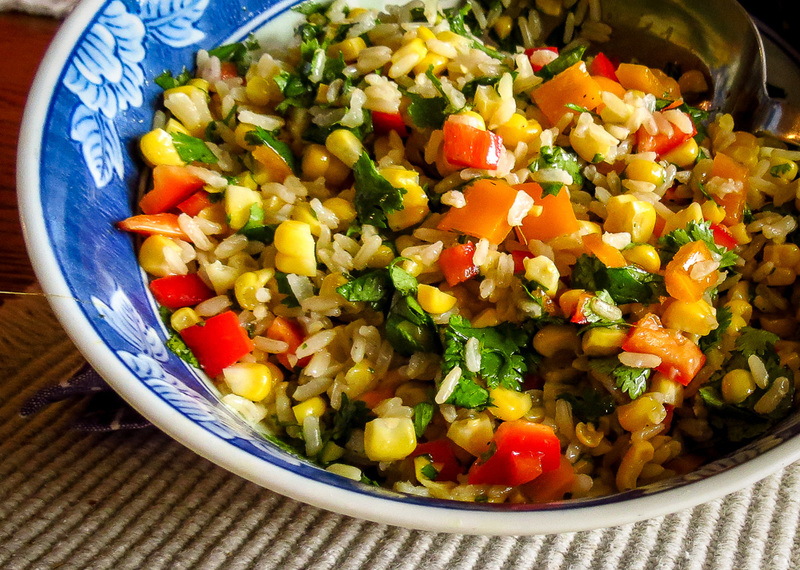 Combine all the ingredients except the cilantro in a medium bowl and whisk together. Stir in cilantro. Chill until ready to serve. 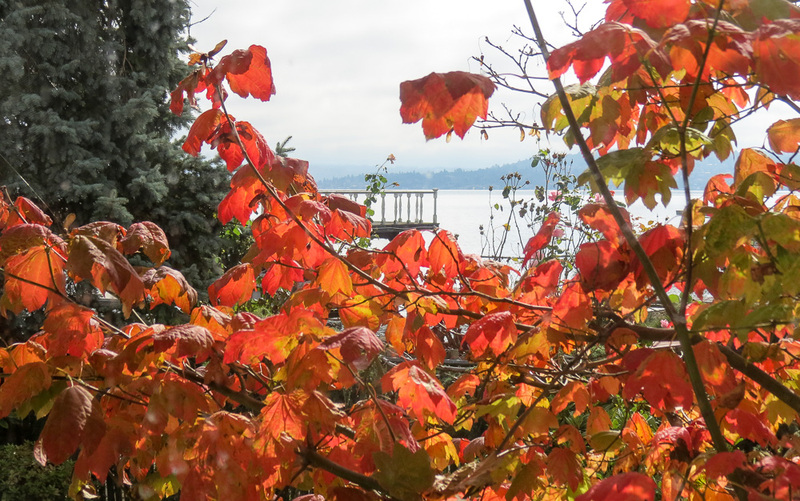 The kitchen view to the southeast reminds me that no matter how warm the temperature, it is already Fall... ready or not, it's here. Put away the summer shorts and pull out the sweaters. We're back ashore, readjusting to life in town for the next several months. Eagles still fly overhead, Canadian geese still honk away to awaken us in the morning, but I find I miss the gentle rocking of the boat and the ready access to just-caught seafood. 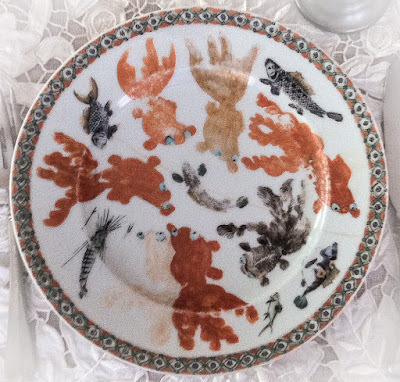 The seafood memory is one of the reasons why I love my assorted seafood plates and platters. 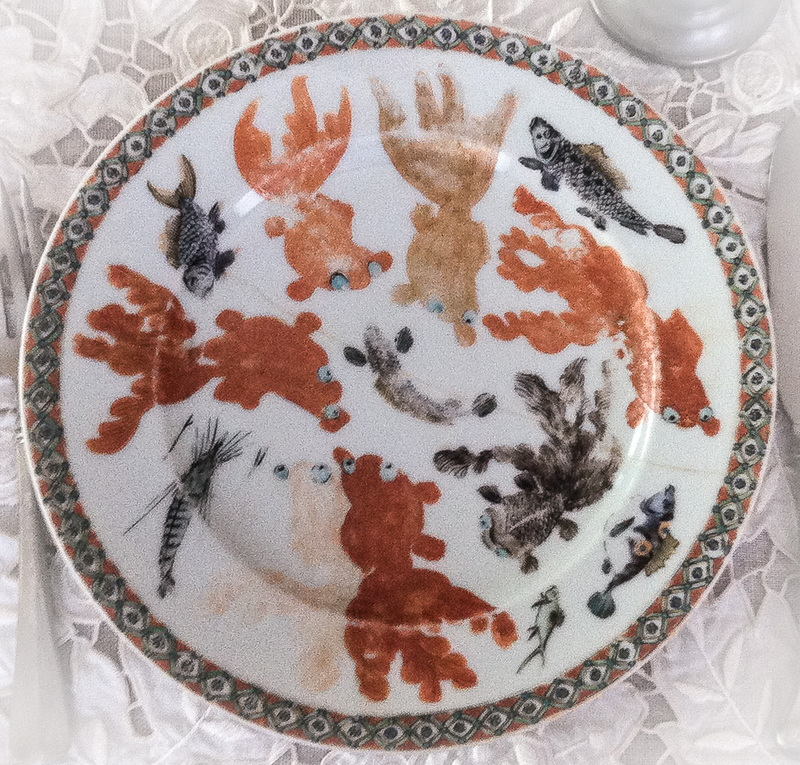 ... you will find a set of vintage, hand-painted porcelain koi plates discovered at a local shop in Seattle's Columbia City neighborhood. Each plate is unique, crowded with a lively swirl of colorful, schooling fish. The plates are more decorative than functional, but no matter. They bring a smile whenever I set them out for display. ...I'm back on crutches again, so niece Hilary and RL have been on kitchen duty. Oh my, we have dined well on their culinary efforts! It would be easy to continue "playing lady", but I miss my usual free-wheeling activity in the kitchen. 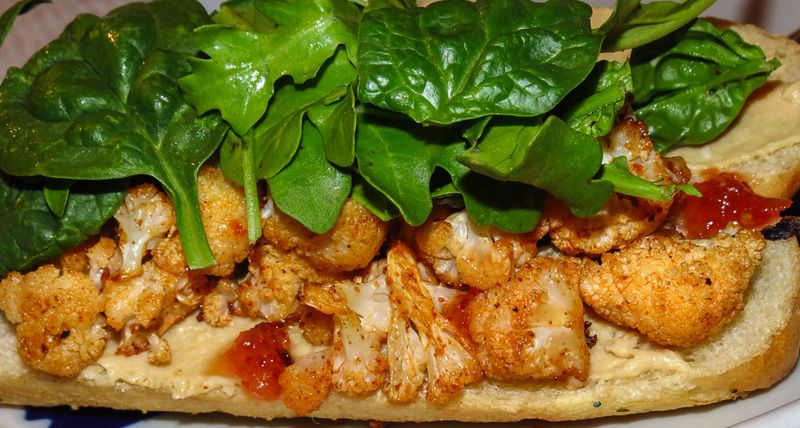 ...a spicy Roasted cauliflower sandwich was so incredibly flavorful that we didn't miss the meat. I know, I know, I can't believe I said that, but it's true. 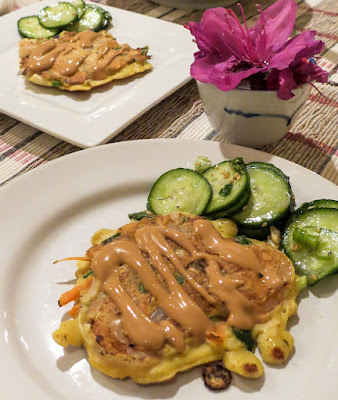 ...we enjoyed yet another version of Okonomiyaki, Japanese Cabbage and Shrimp Pancakes, the product of a friendly kitchen cookoff between two dueling skillets. 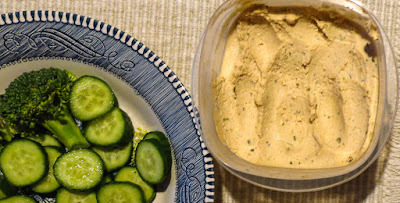 ...Garlicy Lemon Hummus with Raw Vegetables made a tempting light lunch and anytime snack. This chickpea spread might not be pretty, but hummus is SO delicious as a dip, a sandwich filling or straight off a spoon (shhhh, don't tell). 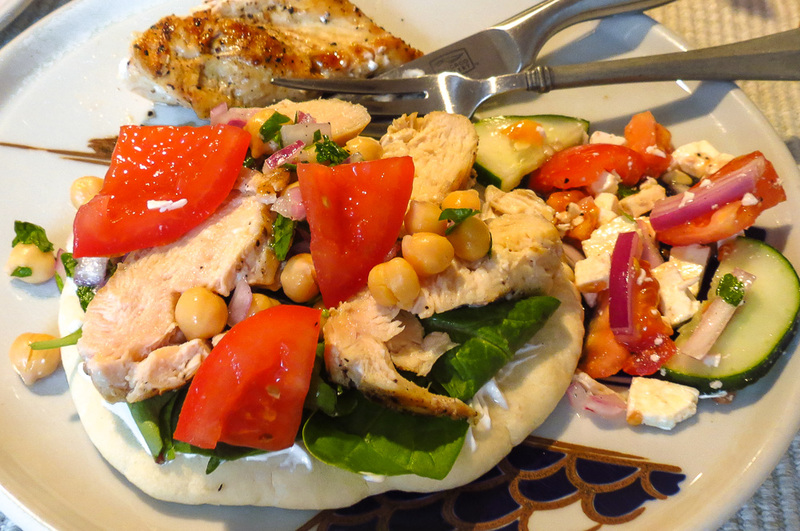 ...Hil pulled a multilayered, multiflavored, winning recipe from a magazine and produced this amazing dinner plate: grilled chicken, marinated chickpea salad, Greek salad with feta and a zippy tzatziki sauce, all piled high on a warm Greek pita. Flavorful, filling and fabulous! ... I'm finding ways to maneuver with one crutch, often leaning on a counter or carefully slicing and dicing while seated on a stool. Lately I've been in charge of leftovers-for-lunch and finally did some baking. Old Faithful, my trusty sourdough starter, welcomed the opportunity to produce a fine loaf of no knead sourdough bread with walnuts and a beer kick. It's good to be easing, ever so slowly, back into action in my kitchen. 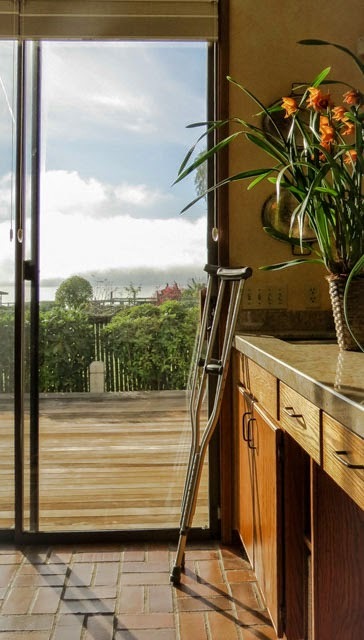 What's happening in your kitchen these days? As usual, Celia at figjamandlimecordial is hosting her monthly linkup to kitchens around the world. Stop by and visit, won't you?